JMM Insights: Membership Looks Good On You! This month’s edition of JMM Insights is from Deputy Director Tracie Guy-Decker. Read more posts from Tracie by clicking HERE. Missed any previous editions of JMM Insights? You can catch up here! I think a lot about what it means to belong. Not only is it the subject of a future permanent exhibit, I believe the need to belong (or the rejection of it) drives a great deal of human behavior. At JMM, we tell you stories of Jewish Maryland. Our tales will make you question, make you laugh, make you think and feel deeply—no matter who you are—because it is stories that make us human. Nearly all of our stories have something to do with belonging, whether it’s the recent immigrant who desperately wanted to belong in America, the Holocaust survivor who knows the dire consequences of being told they don’t belong, or the rags-to-riches scrap dealing family who succeeding in belonging through determination and grit. When it comes to the Jewish Museum of Maryland, we believe everyone belongs. Luckily for us, there are some who choose to make their belonging official by purchasing a membership. There are perks to making it official! All members receive free admission to the Museum every day including to nearly all of our fascinating and engaging programming (between 50 and 60 a year!). Members are also entitled to a 10% discount at Esther’s Place: the JMM Store and invitations to exclusive, members-only events. And don’t forget the free parking, weekdays at the Parking Authority of Baltimore City, Fayette Street Garage (Baltimore and N. East Streets). Perhaps the most important benefit of membership is knowing you’re helping to discover, preserve and tell the stories of Jewish Maryland—stories that belong to all of us—today and into the future.Membership is an important way our family and our fans support us. Not only do your membership dues provide essential resources (about 5% of our revenue), we are often judged by public and private funders by how many members we have, and how many visitors we see each year. That means that every time you visit and bring a friend, you are helping us achieve our mission. 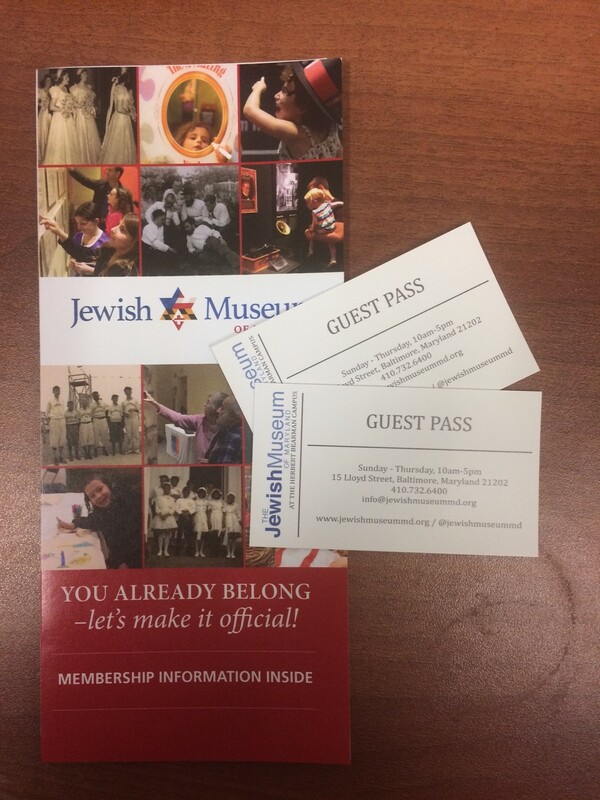 For individuals and families who choose to make it official at the Premium Level of our membership program (Lombard Street Club, Living History Circle, Lloyd Street League, and the 1845 Society), there are some extra perks, including reciprocal admission at select Jewish museums nationally and history museums locally. Because we believe everyone belongs, and because we’ve heard requests for it, we are delighted to announce that we have created a new Grandparents’ Package membership. This membership level will allow families to make it official for Grandparents, their adult children (up to 2), and their grandchildren (up to 4 minor grandchildren). This allows Bubbie and Zayde to include the little ones on their membership, even when they don’t live in the same household. Speaking of households, members at the Family level may notice that we’ve renamed your membership. As a part of our effort to ensure that everyone feels as though they belong, we’ve renamed the membership to be as inclusive as possible. Don’t worry, only the name has changed. The benefits remain the great perks they’ve always been! When it comes to perks of membership, our guest passes are among the most popular. We have good news in that department, too. Effective immediately, for new and renewing Senior Members, the membership now comes with one free guest pass per paid member (i.e. one guest pass for a Senior Member and two for a Senior Couple). This is a new benefit at this level. If you’ve read this far, and you are a member, I have a reward for you—watch your mailbox for a special Hanukkah gift from the Museum in early December. And thank you. If you’ve read this far and you’re not yet a member, what are you waiting for? We can’t wait to welcome you officially. Questions about membership? Contact Sue Foard, membership coordinator, at sfoard@jewishmuseummd.org / 443-873-5162.